While I was up visiting my sister and family this past weekend, I had the opportunity to do some baking with my sis, which I love to do. She’s a great sous-chef (very precise, measures all the ingredients out for a recipe’s mise en place, and always jumps in to assist when needed…as I said, Priceless! ), and being together in the kitchen really gives us a chance to be together and bond. Since we were also making Chocolate Chip Cookies for “the guys” and their UFC Fight Night later that evening, I asked what recipe would she like us to make for *us*…maybe a Sunday morning breakfast treat? After hemming and hawing, the Sis decided that we would make scones. But not just any scones; Cranberry Lemon scones with a sweet, lemony glaze on top, as an homage to the ones she loves so much from Starbucks. 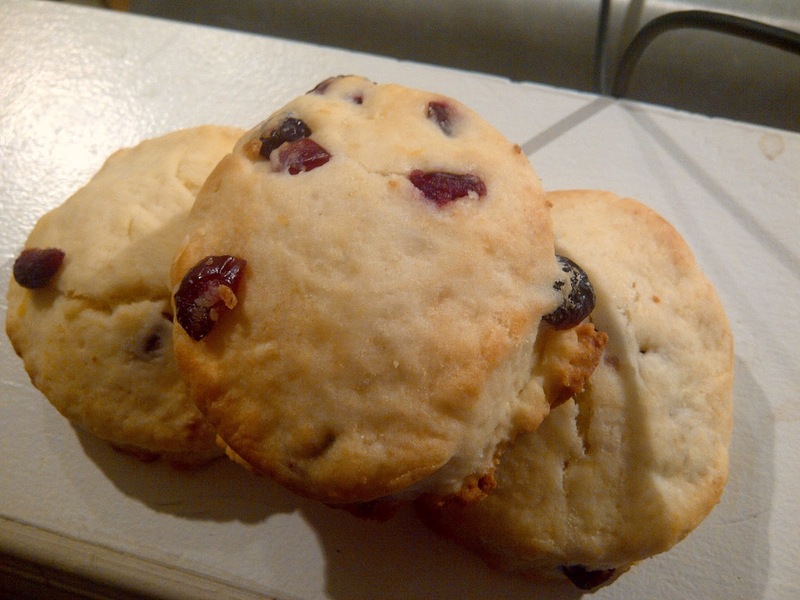 Now, when making scones, they are very much like biscuits; in fact, you could definitely say they are the British version of an American biscuit (although for Britons, biscuit actually means cookie, but I digress…). So the first and best rule to remember when making these is that less is more. Less liquid in the dough, less kneading, less handling over all, will help to make a tender, light, almost fluffy interior and a crispy exterior. Too much liquid, and the dough will collapse under its own weight. Too much kneading, rolling, or handling, and the gluten in the flour activates too much too soon and leaves you with cranberry-scented briquettes on which you could chip a tooth. Given that we were working under a deadline (we had to be back by a certain time to put the baby to bed before the fight, and dinner prep was awaiting), and we didn’t have any biscuit cutters, I think we did rather well! 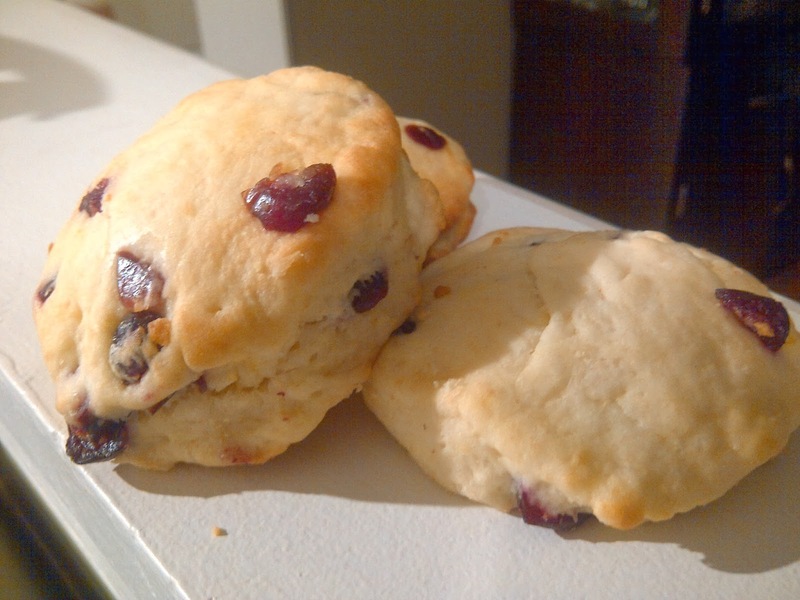 The best thing about these scones is how versatile this recipe is: don’t like cranberries? How about raisins, or currants, or dried cherries, or chocolate chips? Not a fan of lemon? Make it orange zest, or culinary lavender, or espresso powder, or one of several baking spices or crushed nuts. The sky’s the limit! Preheat oven to 400˚ F (200˚ C). Lightly grease a baking sheet. In a large bowl, combine flour, sugar, baking powder, and salt. Cut in butter. Mix the egg and milk in a small bowl, and stir into flour mixture just until moistened. Add dried cranberries and lemon zest. Turn dough out onto a lightly floured surface, and knead briefly to help mixture come together. Roll dough out into a ½” thick round. Use a round pastry cutter to cut into 8 rounds, or a sharp knife to cut into 8 wedges, and place on the prepared baking sheet. If using a pastry cutter, ensure your rounds are cut as close together as possible, in order to minimize the amount of dough that needs to be rerolled (re-rolling the dough will toughen the scones). Bake 15 minutes, or until golden brown, rotating and switching pans once during baking to ensure even browning. Allow to cool completely. Once cool, combine icing sugar and lemon juice into a thin paste (flat icing); using a fork or spoon, drizzle flat icing over top of cooled scones to desired taste. Allow to dry or serve immediately. These should be eaten within 24 hours for maximum freshness. Next Post Recipe and Tutorial: Gluten Free Coconut Macaroons with a Twist!